This month’s email has news on Brexit, Wimbledon Police Station, bin collections in Merton and more. Met with Michele Dix, the Chief Executive of Crossrail to discuss level crossings in Motspur Park and the Independent Affordability Review. Had a meeting with Inspector Whitehead and Chief Supt Benatar at Wimbledon Police Station. I was glad to hear crime remains low in Merton and local police are vigilant about anti-social behaviour and burglary. Met with Clarion Housing to raise cases of incomplete repairs with the top management. I will be spending a day with one of the local repair teams to see things on the front line. Visited Wimbledon railway signalling centre to discuss the length of time the level crossings at Motspur Park and West Banes Lane are down. Met with residents of Preston Road to discuss a planning application from Wimbledon Rugby Club. Went to the MyRaynesParkFestival's Lark in the Park in Holland Gardens. Attended the London Air Ambulance Reception in Parliament to show my support for their amazing work. Visited Donhead School's 'EqualiTea' Party celebrating the centenary of the Representation of the People Act, which gave women the vote. Spoke at Wimbledon High School about Brexit and getting more young people involved in politics. Opened the Joseph Hood Primary School Summer Fair. Announced the winners of the ‘bake off’ at the South West London and St George's Mental Health NHS Trust’s BBQ to celebrate 70 years of the NHS. I led a Parliamentary debate on post-Brexit customs arrangements. We must ensure we protect jobs and businesses, avoid a hard border in Ireland, and reflect the realities at our ports. You can read my speech here. Met with Thameslink to discuss recent disruptions. You can find a full report below. Despite opposition from local residents, the Council are determined to reduce your bin collections and enforce the use of large, expensive wheelie bins. From October, the Council will make use of a multi-bin system, including two large wheelie bins along with your recycling box and a food waste bin. The wheelie bins and recycling box will no longer be collected weekly. That means that you will become the Council’s storage units, keeping their waste on your property for up to 2 weeks, regardless of whether you have space or not. These arrangements do not affect those living in larger purpose build blocks of flats with communal bins. Last month with a heavy heart I pushed my New Clause 18 to the Trade Bill to a vote. This is a decision I agonised over and took no pleasure in making. My amendment did not pass, but I will continue to represent my constituents by fighting to protect jobs and the economy. My new clause stipulates that it should be the Government’s objective to secure a frictionless free trade area for goods with the EU. This is exactly what the Government’s plans are, and have been even before Chequers. Should this not be possible by the 21st January then my new clause states the Government should seek to enter a Customs Union with the European Union. The 21st January 2019 was chosen as the date as the Government has legislated that if there is no agreement by this date it must come to the House of Commons and explain how it proposes to proceed. My amendment was simply a reflection of the Government’s existing plans. If we get to 21st January 2019 and there is no agreement, no deal would be a real possibility. This is designed to be an insurance policy against the event of a no deal. As I said in my debate on customs arrangements, there is a huge risk to businesses, jobs, complex supply chains and our ports if we leave without a deal. For example, HMRC estimates that 180,000 exporters will now need to make a customs declaration for the first time, having not needed to do so previously. Unsurprisingly businesses such as Airbus and Jaguar Land Rover have been increasingly vocal about the risks they face over the last few weeks. It is important to stress that this new clause would not have stopped the UK leaving the EU in March, it does not mean there needs to be a customs union forever - if the technology is developed which comes up with an alternative solution this could still be introduced. Indeed, this is the plan in the White Paper, in which the Facilitated Customs Arrangement will be phased in. My amendment supported the Prime Minister’s plans in the White Paper, and I wish her well. The White Paper was a welcome step in the right direction and must be kept on the road. You can read my short speech on my amendments here – where I also spoke in favour of the EEA/EFTA model once again. I welcome last month’s High Court judgement on the closure of Wimbledon Police Station as it continues to highlight this important issue and I thank all those involved for their efforts. I remain concerned as this ruling will not keep the police station open and therefore urge residents to support our ongoing campaign which would instruct Merton Council to buy Wimbledon Police Station and lease it back to the police. The High Court’s legal judgement does not require the consultation to be re-run; there can simply be a decision on whether there is a need to postpone the closure, pending any evaluation of the new technology behind the scenes. The Mayor of London is unlikely to change his mind and admit he was wrong to close the police station as a result of this ruling. We hope the local community will use this result to come together and push for Merton Council to reverse their refusal to buy the Police station and lease it back to the police which seems to us the best way to ensure the station actually stays open. I recently met with Thameslink to discuss the recent timetable changes and the disruption caused to commuters. Firstly, Thameslink apologised for the disruption. I asked for a full explanation for the cause of the disruption, and in short this was because of a failure of process which led to only three weeks to prepare for the new timetable, which then could not be adequately resourced. This failure was the joint responsibility of both Thameslink and the Government owned Network Rail. Secondly, I was given assurances that the new July timetable, which came into force last week, will be reliable. This is because the full range of necessary preparations had been made, allowing it to be resourced. 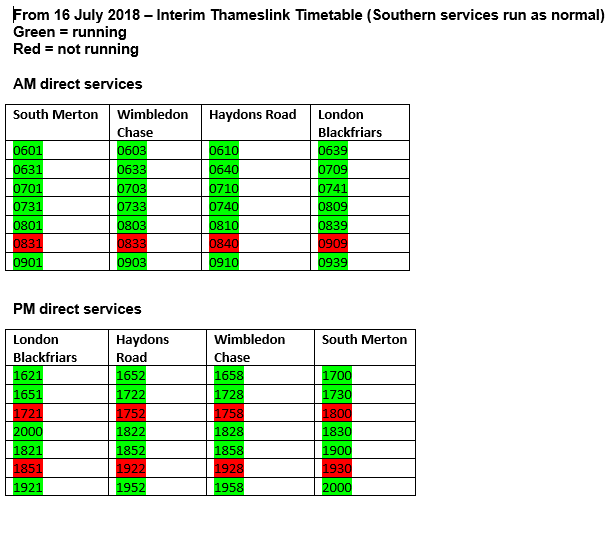 You may have noticed that this new timetable has fewer services, and details of those services which are not currently running are in red below. I am told the plan is for the full service to run by December. I intend to monitor the July revised timetable’s ability to deliver a good service and to be updated on the December revisions. Following the delays and cancellations, there are a number of options for compensation. Delay Repay compensation for delays of 15 minutes or more can be accessed here (including an enhanced compensation for repeated delays). Claims can be made online by entering a few key details and providing a copy of the ticket. Furthermore, in agreement with the Government, Thameslink will be offering additional compensation through an industry scheme for passengers most severely affected by disruption following the May timetable changes. This will be paid to qualifying season ticket holders. More information about the scheme and the criteria can be found here. Finally, please do get in touch with me on hammonds@parliament.uk if you find that the service has not improved. I visited the Network Rail Wimbledon signalling box recently. I wanted see the controls for the barriers at Motspur Park and on West Barnes Lane after complaints from residents about the length of time they're down. I was interested to see they're both manually operated, and I have requested data on the barrier downtimes over the last 4 months. I also discussed technological options to make the process more efficient with the Chief Operating Officer of the route. and tickets are now on sale.